Consumers around the world trust Coinstar® machines to provide a convenient and reliable coin-counting solution. We’ve built our reputation on 25 years of customer service and more than one billion successful transactions since the first machine was installed in 1992. Consumers can trust Coinstar to count their loose change quickly and consistently, and strive to make sure customers have the best coin-counting experience. That responsibility drives everything we do, and Coinstar’s dedicated customer service team is available seven days a week to answer questions and resolve concerns. 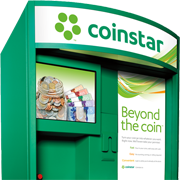 By focusing on convenience and dependability, Coinstar has become the leader in self-service coin counting. Our continued success is the result of advanced innovative technology—Coinstar holds more than 110 patents—and a proven platform that undergoes rigorous testing to ensure machines are highly accurate and reliable. Thanks to real-time monitoring and trained technicians that regularly service the machines, Coinstar machines feature exceptional uptime performance. Coinstar helps retailers generate revenue and increase profits by providing a hassle-free way to offer consumers a coin-counting service—one they recognize and trust—right where they already shop. Because every machine in every country is owned, maintained and serviced by Coinstar, retailers don’t need to waste energy—or money—dealing with machines. Better yet, no investment is required to get started. There are no capital costs, no operating costs, and no maintenance fees.